Cut the fish into long strips. In a large bowl, add the beer, flour and baking powder. Mix well and add the salt, paprika and cumin. Mix again. Whisk until the batter is no longer clumpy. Add the fish into the beer batter. Heat the vegetable oil in a small pot over high heat. Using tongs, add the strips of fish to the hot oil. Cook for several minutes or until the fish is golden brown. Remove the fish from the oil and place on a plate lined with paper towels to drain. Heat a tortilla over an open flame for about 2 minutes and add a spoonful of the fish preparation in the middle. Garnish with radish, lime, crema, cabbage, onion, pico de gallo, and salsa. Serve all the condiments to the side to allow your guests to build their own tacos. For a few years now, my family and I have been going south of Los Angeles to Ensenada, Mexico. The border town offers plenty of fun activities, at least for my family and I! We play on the beach and sunbathe, have a few drinks on the boardwalk, and most importantly, eat a lot! 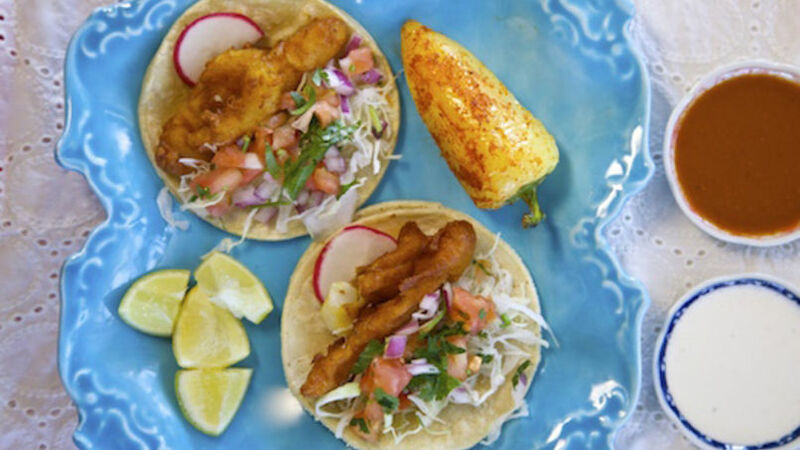 We like to sample an assortment of foods but my favorite dish by far is (and will always be) the Ensenada fish tacos. The tanginess of the lime and the freshly battered fish is simply the best. Enjoy them with an ice cold drink!